Home » Uncategorized » Internet March Mayhem e-Tournament: First Round Begins! Internet March Mayhem e-Tournament: First Round Begins! Every March, college basketball has one of the most exciting tournaments in all of sports. For years, the non-athletes and geeks among us have yearned to experience the drama, the excitement and the posturing that is the college basketball tournament – but alas, we don’t know anything about basketball. 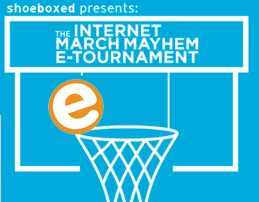 Enter the Shoeboxed Internet March Mayhem e-Tournament. We’ve taken 64 of the best blogs, web celebs, start-ups and social media services and pitted them against each other to determine who will claim the championship. The first round began yesterday and will continue through Friday. Vote for your favorites. You can vote once for each match up. Make sure you favorites get through by telling your friends and coworkers to vote! Shoeboxed presents the first annual Internet March Mayhem e-Tournament where your votes decide who moves up in the bracket.Competitors face off in four categories: web celebs, blogs, social media sites, and internet startups.Users’ votes will determine who the winners of each round are.Round 1 voting begins now and will conclude on March 27th.Those who will be moving to Round 2 will be announced on the Shoeboxed blog early on March 28th.Time is of the essence, so be sure that your team gets the most votes so that you can make it to the championship. The road to the final four is sure to be paved with upsets and overtimes, so get your votes in now and watch the tallies grow. Check out the bracket and vote for your winners. Hah, oh how I really don’t yearn to be part of what I witnessed in a random sports bar last week in Austin! Can you believe I had NO IDEA what March Madness was until the Twitter crowd pounced on me with their own definitions?! Maybe we’ll see you in the Sweet 16, in which case maybe we can just merge together to become a small business receipts-to-invoice juggernaut and steamroll through the bracket. Actually that’s probably not allowed. I’ll check on that. Who’s idea was it to seed VFTW, a blog about vote-spamming, #15 in a tournament scored solely on votes?